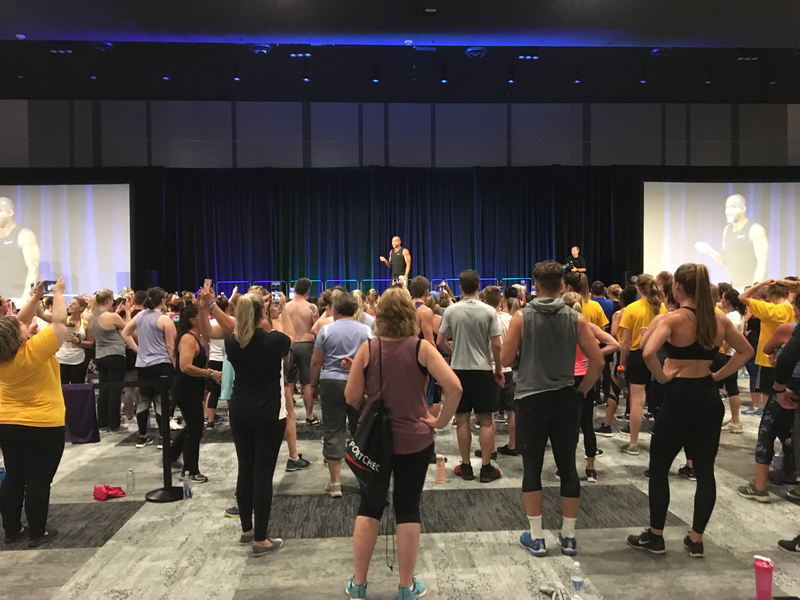 A damp Saturday morning came to life with a group workout hosted by celebrity fitness trainer, Shaun Blokker who goes by stage name Shaun T.
About 100 people packed a conference room on the lower level of the Halifax Convention Centre and were put through a grueling workout that involved no weights but constant body movement. “Oh my God, that was the most amazing experience,” said one of the audience members, Lisa Boutilier. Shaun T is a fitness expert and dancer. He has starred in the workout videos like Hip Hop Abs, Insanity and T25. It is obvious by watching his workout why Shaun T is popular. His workouts are demanding and will get anyone in great physical condition but he is fun. He jokingly made the cameraman do a few squats. Even though he is doing the workout himself, he is constantly yelling positive motivation. “If you miss the ground, you miss an opportunity to better yourself,” he said during one of the exercises. He didn’t stay to himself, he would regularly come on the floor to workout with people, fix their form and give encouragement. The event was the finale to a Dalhousie University’s Health Living, Healthy Life Conference. Dal has been working on the Shaun T event for two years because they wanted to get someone big for their 200th anniversary. The Dalhousie Gazette was unable to do a formal interview with Shaun T. However, he spoke at the event. He said he wanted to come to Halifax for 15 years. During his first international flight, Halifax appeared on the flight map and he was curious about the city ever since. He noticed the kindness of the people in in the city. He said when he was driving into Halifax he accidently got stuck in the MacPass lane on one of the bridges. An employee came over and sweetly told him it was only a dollar to get through. “I was like I’m definitely not in New York because they would cuss me out,” said Shaun T.
After the workout, he took 40 minutes to answer questions from the crowd. Many people in the audience explained how his videos have helped them overcome challenges and asked him more life advice questions than workout ones. Shaun T has dealt with being sexually abused as a child. He genuinely answered every question and kept pushing for more time to answer more questions. One lady asked him how he deals with traumatic episodes. “If you’re still here, you utilized some sort of tool that got you out of that place, so when it comes back you reach into that backpack and you’re like okay where’s that tool that I am going to use to help me get outta there,” Shaun T said. The emotional connection he was able to have with people show that he is as much a motivational speaker and a life coach as he is a fitness coach. Boutilier came wearing a shirt she made herself that has one of Shaun’s famous sayings ‘conquer your mind, conquer your life.’ She believes she was meant to be at this event.